BALTIMORE -- A swine flu virus strain was detected in 20 people in Maryland who were in close contact with pigs at two county fairs, CBS Baltimore reports. The Maryland Department of Health reports none of those infected with the influenza virus strain H3N2v has become seriously ill or been hospitalized. "We're reporting a total of 20 cases associated with contact with pigs at these county fairs," said Dr. Katherine Feldman of the Maryland Department of Health. "Right now, it's really only causing illness that's similar to seasonal influenza, so people will have a fever. They'll have coughing, a sore throat. They may even have some signs." Those infected were in close contact with pigs at the Anne Arundel County Fair or the Great Frederick Fair in Frederick County. Health officials believe the virus does not pose a threat to most fair visitors. Test results from the pigs at the Great Frederick Fair were confirmed as the subtype H3N2, with 95 pigs still in isolation. Many of those pigs are fighting off the swine flu, under their owner's care, and the watch of the Department of Agriculture. "We're just kind of waiting it out to see what the results are as far as the remainder of the tests that are pending," said Karen Crum, the Frederick Fair executive assistant. Three farms in Frederick County have also been placed on a hold order, because some pigs were discharged from the fair before the virus was detected. 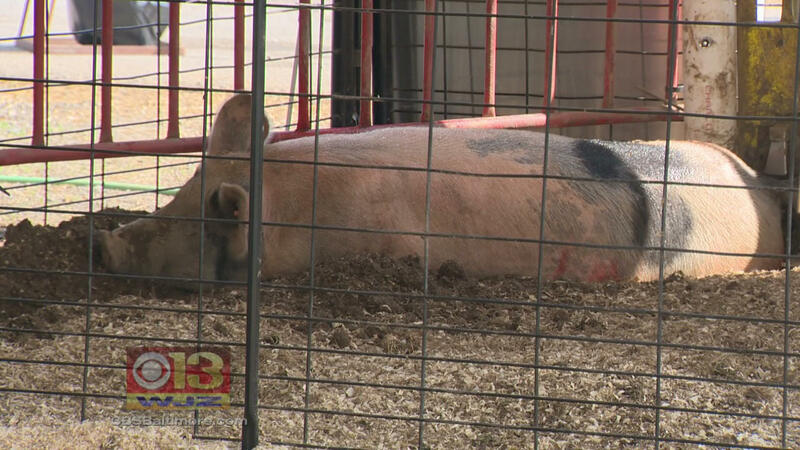 Feldman says so far no cases have been dangerous enough to land anyone in the hospital, but to curb exposure the Maryland Department of Agriculture has ordered no pigs to be on display in Calvert County exhibits. The exhibits were cancelled at the last fair of the season. More than 100 pigs at the Charles County Fair were quarantined last week after some showed flu-like symptoms. Those pigs have been released, and the swine barn will be thoroughly cleaned and disinfected. For anyone already feeling the symptoms, Feldman says call a doctor who may then alert the Health Department. "We then will investigate to better understand what led to their illness, what kind of contact they had with swine," she said. She says high-risk patients include young children, older adults and pregnant women. To avoid the flu, those at high risk should stay away from pigs altogether. Others should keep their hands away from the pigs. The flu does not impact the quality of any pork products when properly cooked. It's been five years since the swine flu last popped up at a county fair in Maryland, CBS Baltimore reported.